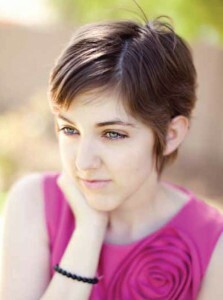 Carolyn “Ceci” Christenson, age 18, of Gilbert, Ariz., has already survived a rare, life-threatening blood disorder and become a high-powered recruiter for the National Marrow Donor Program (NMDP). Her experience inspires Christenson to speak out for patients whose hope for a cure resembles a high-stakes lottery. In December 2011, she appeared on CBS’s “The Early Show” to promote the need for bone marrow donors. Being on the show fulfilled her altruistic request to Make-A-Wish Foundation. In March 2009, Christenson, then 15 and a high school freshman, had gone to the hospital with bruises, pale skin, fatigue and shortness of breath. A lab test found that only half the normal amount of blood was circulating in her body. She never went back to high school. Over the next six months, frequent hospital stays for blood infusions and treatment of blood clots and various infections finally led to a diagnosis: myelodysplastic syndrome (MDS), which caused her blood cells to die prematurely. The only known cure was a bone marrow transplant. Roberta Adams, M.D., Mayo Clinic medical oncologist and director of the combined Mayo Clinic/Phoenix Children’s Hospital bone marrow transplant program, began the search for a donor by testing Christenson’s family members. Christenson was one of the fortunate few with two matches — her older brothers, Allan and Ryan. In December 2009, Dr. Adams transplanted healthy stem cells from Ryan’s bone marrow into his sister, where they started producing blood cells. “I’m cured. I’m MDS-free,” Christenson says. But recovery has been a slow, unsteady process. She developed a complication when the transplanted cells and her own cells waged a battle of immune responses. In May 2011, she started an 18-month outpatient treatment at Mayo Clinic, where withdrawing her blood and exposing it to ultraviolet light quiets the cellular unrest. “It has worked so well. I am thrilled,” says Christenson, now able to socialize again. She recently enrolled at a community college and plans to major in journalism at Arizona State University. Through her medical crisis, Christenson learned about the need for donors. According to NMDP (marrow.org), more than 10,000 U.S. patients a year are diagnosed with life-threatening diseases for which a marrow or umbilical cord blood transplant from an unrelated donor may be their best or only hope of a cure. Motivated by her own second chance at life, Christenson has been recruiting for NMDP’s Registry since before her transplant. She created a website (www.cecisclimb.com) to tell her story and encourage others to join the registry. “Fighting cancer is hard. Finding a match shouldn’t be,” Christenson says. The article comes from our Sharing Mayo Clinic print publication.